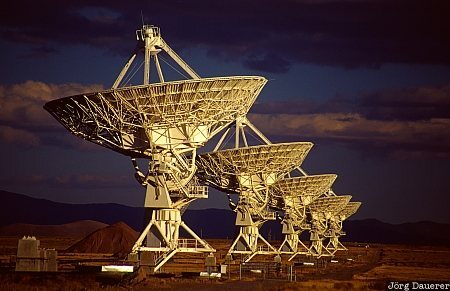 The radio antennas of VLA (Very Large Array) radio astronomy observatory near Magdalena illuminated by the last light of the day in front of a dark sky. Magdalena is in the south of New Mexico, United States. This image was taken in the evening of a sunny day in February of 2004. This photo was the image of the month in July of 2012.